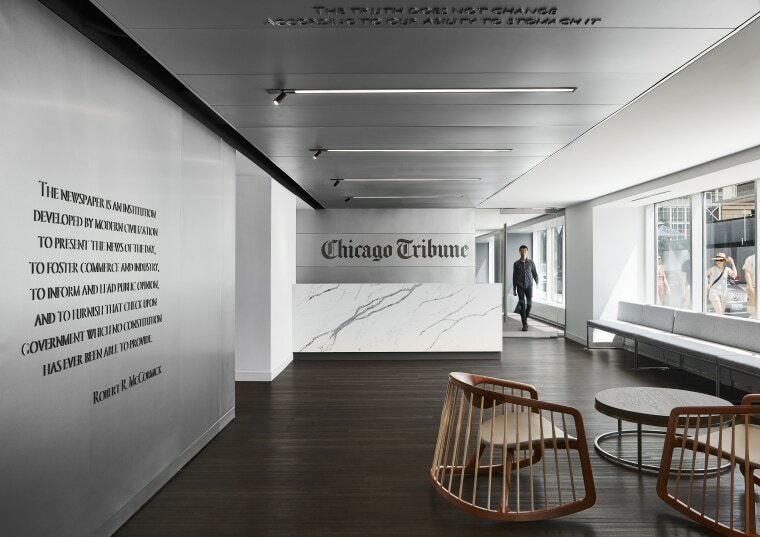 When the Chicago Tribune moved from its home of nearly a century in its iconic namesake tower, it was an opportunity to relocate to a modern media environment. 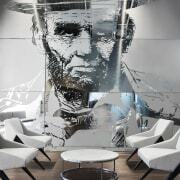 But Eastlake Studio’s design of the new premises also brought a sense of legacy from the old building, such as quotes on freedom of the press from the old lobby, now embossed on aluminium wall and ceiling panels in the new reception. Like many businesses based on traditional models, the newspaper industry has had to front up to major disruption in the past decade. And as print circulation dropped and advertising revenue moved to online, the survivors have been companies that evolve into creating content for multiple channels – with a big focus on digital as well as print. In the process, media companies have had to rethink the design of their workplaces, so as to foster this wider approach to content. For many, this has meant moving to new, purpose-designed premises to achieve the staff interactions they needed. One such company is the Chicago Tribune, which recently moved out of its namesake Gothic Revival building at the junction of the Chicago River and the city’s Magnificent Mile, and into the Prudential Plaza, a Mid Century office building south of the river. But while the move enabled the design of a modern workplace in tune with today’s fast-paced business, the company also wanted to preserve a sense of its 171-year history, nearly a century of which was spent in its previous iconic premises. 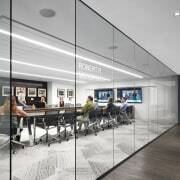 On the first floor of the Chicago Tribune’s premises are a number of formal and informal meeting rooms, many named after Pulitzer Prize-winning stories and staff. 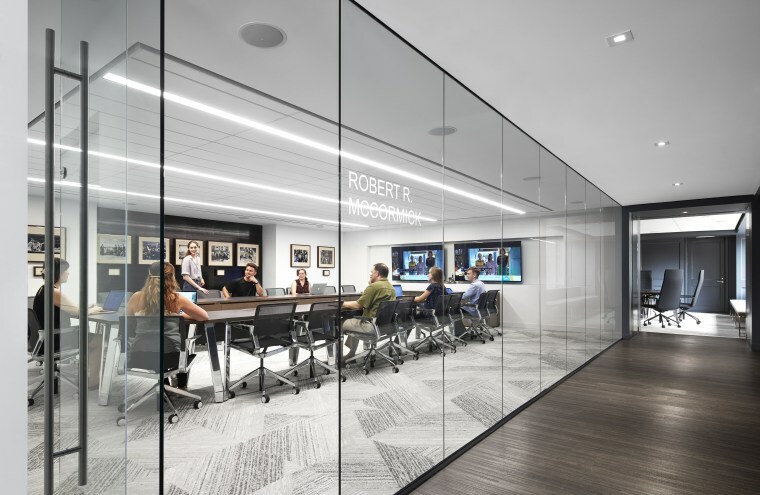 The Page One conference room takes its name from Robert R McCormick, editor and publisher of the Tribune in the early to mid-20th Century. Architect Tom Zurowski of Eastlake Studio says the project was particular poignant for his firm, which had had its studio located in the Tribune Tower for 30 years. “We’d worked with the Tribune on several smaller renovation projects. So not only could we empathise with the daunting relocation, we knew the buzz of energy in the space that made a daily newspaper and created a myriad of digital content,” he says. Much of the Prudential Plaza had already been upgraded prior to the Tribune having identified that the remaining space suited its current requirements. 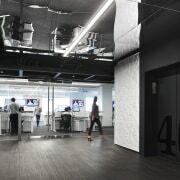 Two floors – each of 4640m² – at levels three and four accommodate the main production areas, including a state-of the art breaking newsroom on the third floor. 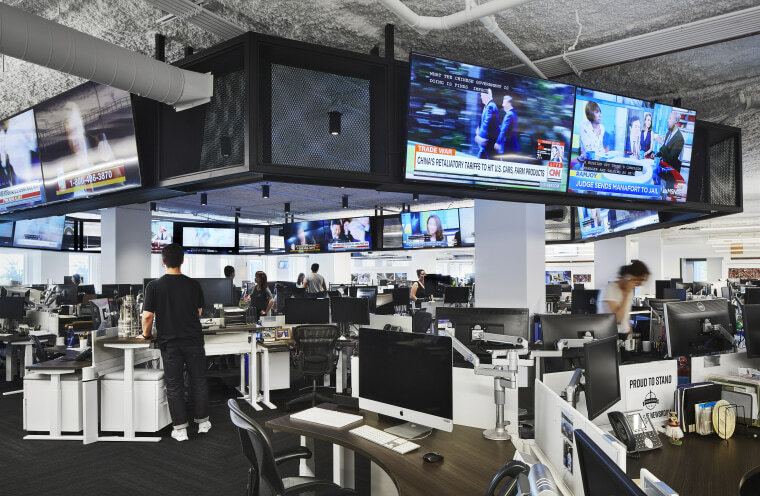 Here, workstations are arranged by team beneath a ring of 42 television screens, allowing staff to monitor multiple channels simultaneously. 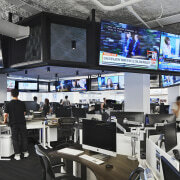 A large ring of 42 monitors in the new Chicago Tribune newsroom mean journalists are continually in touch with breaking news across a number of channels. 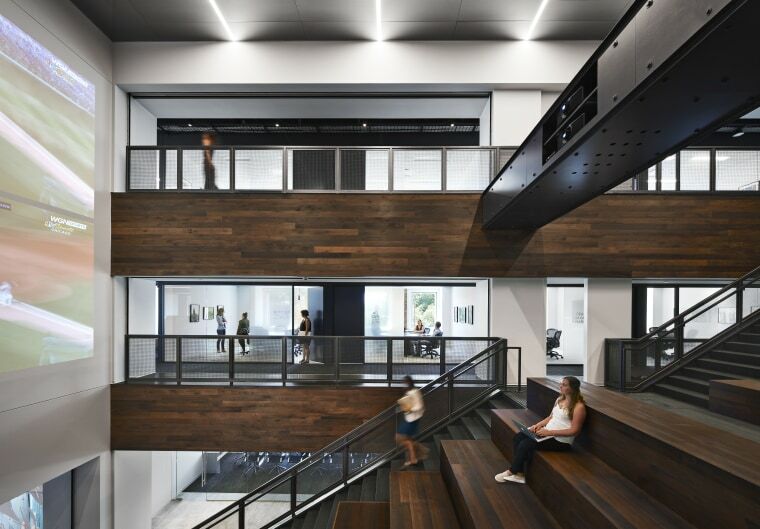 RedEye, Chicago magazine and other Tribune-owned publications are on the fourth floor, with a similar layout that is designed to maximise natural light and keep sightlines open. 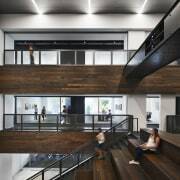 Combined, the ground level, mezzanine and editorial floors have 34 phone rooms, 560m² of collaborative workspace, and numerous formal and informal conference rooms, many of which are named after Pulitzer Prize winning stories and staff. 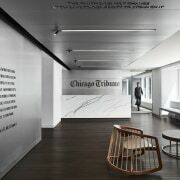 The monumental staircase in the Chicago Tribune’s new premises in the Prudential Plaza serves as the central artery of the fit-out. 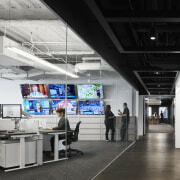 The large millwork steps connect the ground level to the editorial floors, providing a dynamic space for communication, with stadium seating and a projection of the 24-hour news cycle. Acting as a core artery, a massive staircase runs from street level through to the fourth floor. 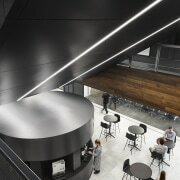 A few steps up is a 390m² cafe, open to the floors above and designed to encourage daily interaction between the different departments and publications. Working with the Tribunes’s executives, Eastlake sifted through storage units and archives to source material for the new design, including an antique conference table from Tribune Tower’s boardroom and throwback newspaper printing plates. 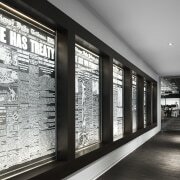 And in a nod to its legacy, past location and new incarnation, quotes relating to freedom of the press that were carved in travertine in the old building’s lobby have been re-cast as embossed text on aluminium wall and ceiling panels in the reception area of the new premises.